Texas Democrats may not have a full statewide slate yet, but they are seeing early and intense interest in several congressional races. Lillie Schechter, the new chairwoman of the Harris County Democratic Party, has watched in recent months as at least seven candidates have come through the doors of the party headquarters to introduce themselves, eager for their shot at U.S. Rep. John Culberson, R-Houston. That's seven candidates that she can recall, but she may be forgiven for forgetting: Texas' 7th Congressional District is one of several that have already drawn a swarm of Democratic candidates for 2018. The bonanza is unfolding not just in districts like the 7th — one of three in Texas that national Democrats are targeting — but also in even redder districts, delighting a state party that is not used to so much interest so early. "When we have competitive primaries, we get to engage with more Democrats," Schechter said. "I do not see that as a negative thing." Yet it's just one part of the picture for Democrats at the outset of the 2018 election cycle. While the congressional races are overflowing with candidates, the party remains without a number of statewide contenders — a reality that is coming into focus ahead of Republican Gov. Greg Abbott's anticipated announcement Friday that he's running for re-election. Barring any last-minute surprises, Abbott will make his second-term bid official without the presence of a serious Democratic rival. The state's Democrats are urging patience, saying they are in talks with potential Abbott challengers and other possible statewide candidates. "I think if you look in past years, traditionally candidates will start filing in the fall, and by the end of the filing deadline, I think we'll have a full slate of strong candidates to run statewide," said U.S. Rep. Joaquin Castro of San Antonio, who himself took a pass on statewide race earlier this year, declining to challenge U.S. Sen. Ted Cruz, R-Texas. "I know there's been a lot of energy across the country and in Texas on the Democratic side, and so many people want to get a move on already, but by the end of year, I'll think you'll see a full slate of strong Democratic candidates." So far, Democrats have three statewide candidates they see as serious: U.S. Rep. Beto O'Rourke of El Paso for U.S. Senate, Houston-area accountant Mike Collier for lieutenant governor and Kim Olson, a retired Air Force colonel, for agriculture commissioner. They are without similarly credible contenders for governor, comptroller, land commissioner, railroad commissioner and attorney general — a seat considered particularly worth targeting because the GOP incumbent, Ken Paxton, is under indictment. By far the biggest profile belongs to O'Rourke, who announced his challenge to Cruz in March. As the top of the ticket — assuming he wins his party's primary next year — he stands a chance of being Texas Democrats' standard-bearer in 2018, regardless of whom they ultimately put up for the other statewide jobs. In an interview Monday, O'Rourke said he was not worried about the lack of company so far on his party's statewide ticket. "I can't worry about what I can't control, and so we're just going to focus on our campaign," he said. 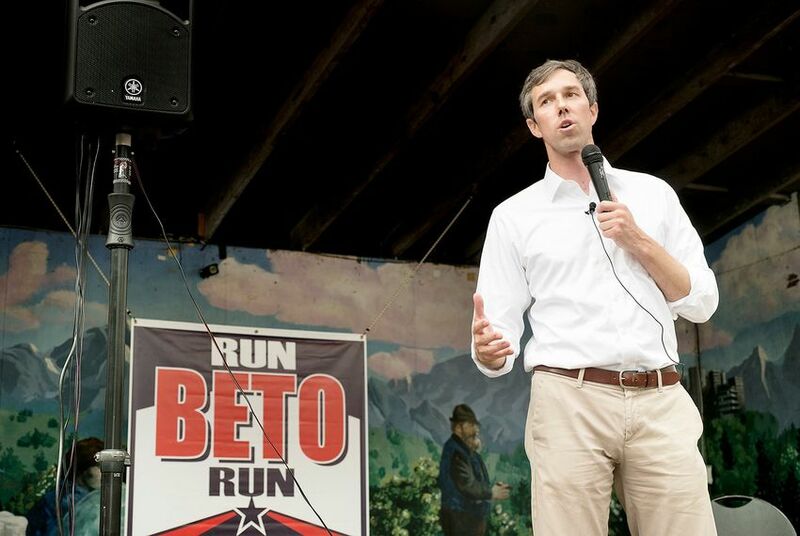 But he also expressed optimism for the party's prospects up and down the ballot in 2018 "as more people become aware of how significantly the dynamics have changed in Texas." It may be somewhat early, but the lack of a gubernatorial candidate — or even a well-known potential contender — is particularly glaring. Taking out Abbott would likely be an even steeper climb than usual for Texas Democrats seeking statewide office, as the governor has a massive $34.4 million war chest. It's a number expected to grow by the millions when he discloses his latest fundraising numbers next week. Of the last four Democratic nominees for governor, none of them announced his or her campaign this early. The closest was 2006 nominee Chris Bell, whose announcement came on July 28, 2005 — 467 days before Election Day. The 2018 election is currently 481 days away. Yet previous cycles have typically brought a bit more excitement and buzz leading up to such announcements. There were the months of speculation that came before the launch of South Texas millionaire Tony Sanchez's 2002 bid to become the first Hispanic governor of Texas. In 2014, former state Sen. Wendy Davis kept Democrats waiting until 14 weeks after her anti-abortion filibuster made her a national star. This time around, such hype is subdued at best. Perhaps the most prominent name to garner some speculation is former state Rep. Trey Martinez Fischer of San Antonio, who recently told his hometown newspaper a potential candidacy is "not a conversation that I'm entertaining at this time." While there has not been frenzied speculation about the governor's race, Democrats note their talent was on full display earlier this year when two rising stars, O'Rourke and Castro, both seriously considered the Senate race. While Castro ultimately declined to run, there's still another statewide contest that could involve two credible Democrats: former state Rep. Allen Vaught of Dallas is weighing whether to join Collier in the race for lieutenant governor. In any case, the current state of Democrats' statewide ticket provides a contrast with the congressional map, where several vigorous Democratic primaries are already underway — not just in the three districts in the crosshairs of national Democrats but also in a few not on their radar. There are at least half a dozen Democratic candidates in the 21st district, which is currently represented by Lamar Smith, a San Antonio Republican who drew only two challengers in 2016 and won re-election by more than 20 percentage points. In the 31st district, John Carter, a Round Rock Republican, is up to at least four Democratic foes after just one ran in the primary last time. Candidate after candidate points to a common denominator in their decision to run. “Knowing what happened on Nov. 8 and knowing that Donald Trump is our president ... it’s just really galvanized a lot of Democratic support all around the state and locally, and people are stepping up," said Ed Meier, a former Hillary Clinton staffer looking to unseat U.S. Rep. Pete Sessions, R-Dallas. Early signs indicate some of the races are also drawing big money. In the 32nd district, Meier's campaign says he raised $345,000 in its first two months, while another Democratic hopeful, Colin Allred, took in more than $200,000 over a similar period, according to his team. In the 7th district, Democratic contender Alex Triantaphyllis says he raised over $450,000 in eight weeks, while primary rival Lizzie Pannill Fletcher has announced a haul of more than $365,000 in seven weeks. With Abbott's announcement looming, though, the spotlight is intensifying on Democrats' statewide recruits. Republicans say they are being anything but complacent as they wait for Democrats to fill out their statewide ticket. "Texas Democrats have two problems aside from being unable to field a full slate of credible candidates in 2018: We're mobilizing our grassroots as vigorously as if they did have that full slate, and Texas Republicans continue to deliver for Texans," state GOP spokesman Michael Joyce said in a statement. Harris County, the biggest in Texas, will no doubt be on their radar next year. While Clinton easily won it in the 2016 presidential election, it has a history of being a battleground for both parties — and a highly prized ingredient in any recipe for statewide victory. For all the Democratic enthusiasm in the Trump era, Schechter said she was not too surprised it has not yet translated into a full and robust statewide slate. "I think Texas is a really big state, and it's a really big challenge," she said, adding that her central focus is the countywide ticket in 2018. "We still need to shore up our votes in a major metropolitan area like Harris County to make it an easier statewide run." Abby Livingston contributed to this report. O'Rourke on Cruz challenge in 2018: "I really want to do this"